Everyone knows that this time of year is tough. There's a constant chill in the air, very little light at all during the day and as Christmas becomes a somewhat distant memory, the January blues begin to set in. Today is supposedly 'Blue Monday', the most depressing day of the year. Despite many suggesting that the idea of Blue Monday is a silly, unproven concept, I do think there is definitely truth in the fact that this time of year is, well, a little bit depressing. We wake up in the dark, get home in the dark, it's constantly raining and summer seems forever away. Okay... so it's not spring, but what better time than January to whip out the feather duster and give your house a deep clean? You can organise your makeup and have a clear-out of any gone-off or unwanted cosmetics, give your desk a re-jig or organise your bookshelf. 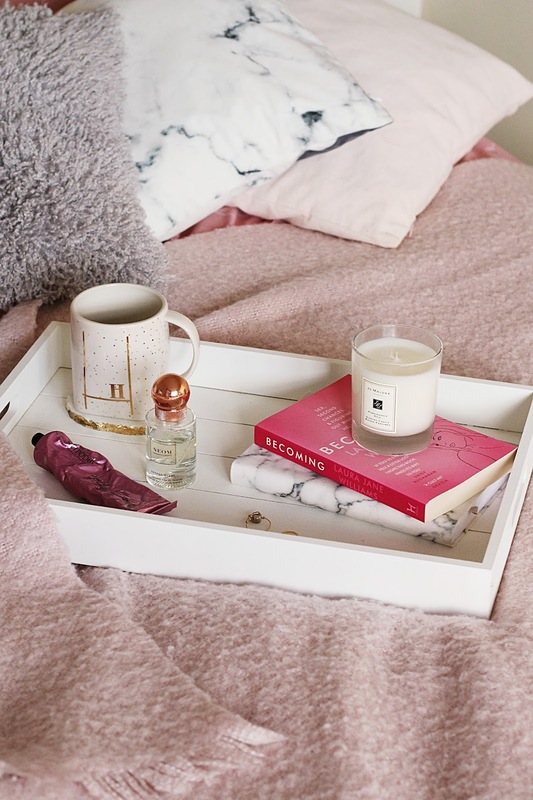 I honestly think there is nothing more therapeutic or mood-boosting than having a clean, tidy, happy home - so give it a go and see if it helps to shine a bit of light into your life. If there's a time of the year I know for certain I'm going to feel oh-so 'meh' about myself, it's during January. A few too many chocolates have been consumed over Christmas, and the party season has well and truly taken its toll on my skin. An instant way to turn things around? Take a trip to the hair salon and get yourself a new 'do. Whether you want to go for a dramatic 'New Year, New Me' change or a simple freshen up - letting yourself be pampered will make you feel so much better. A good hairdo can change your life, so they say. Because this time of the year can be pretty dull and depressing, why not try taking up a new hobby to inject some excitement into your life? You could take up a class at the gym, hone your photography skills, try bullet journalling or even have a go at calligraphy. I definitely think this time of the year is perfect for taking up new hobbies and learning new skills - and just think, this time next year, you could be a pro at your new hobby! Especially after Christmas, it can be really easy to drift apart from your friends at this time of year. Everyone is busy with work, trying to save money or has other commitments, but it really is crucial you keep in touch with each other in order to keep positive and boost your mood. Make sure you drop them a text and arrange to meet up for lunch or, if money is tight, a coffee at your place. Having friends around you is guaranteed to make you feel brighter. Despite how cold, wet and windy it might be, getting outside is often the best medicine. We spend so much of this time of year cooped up inside, and especially if you don't have a dog to walk, there's often no reason for you to really need to venture into the great outdoors. However, a walk around your favourite country house or park can make you feel more awake, refreshed, and just generally make you feel better. Give it a go - and then reward yourself with a hot chocolate when you get back inside! We might all be a bit out of sync after consuming everything in sight over Christmas (Celebration anyone?) but all that unhealthy food has probably left you feeling sluggish and irritable. So, why not grab a recipe book (or have a little look online) and get making some new home-cooked meals from scratch? You could sign up to a meal subscription service, or take a look at some food blogs like the lovely Gem at The Mother Cooker - she does some amazingly tasty-yet-healthy meals that are sure to inspire you! You know what I think is always a guaranteed mood-booster? A cuddle from an animal. Seriously, whenever I'm feeling blue, snuggling up with my dog makes me feel so much better. I think it's actually been proven that animals can boost your mood and your mental health, as there are now so many therapy pets out there helping people. Don't have a pet? Don't worry - why not offer to pet-sit for a friend or, better still, volunteer at an animal shelter? You'll feel better for helping at get a mood-boost from seeing those adorable animals. What could be better? How are you keeping positive this January? Let me know!